Born: Tuesday, 20 October 1953. Primary Education: 1959-1966 at St. Anthony's Catholic School, Umudioka, and St. Gabriel's Catholic School, Ifitedunu. Secondary Education: Christ the King College, Onitsha (1967). His education was interrupted by a civil war in Nigeria (1967-1970). Through the inspiration of then Monsignor Emmanuel Otteh (Late Emeritus Bishop of Issele-Uku) he continued his secondary education at All Hallows' Seminary, Onitsha (1970-1973) and completed at Colliery Comprehensive Secondary School, Enugu (1974). Post Secondary Education: Philosophical Studies: 1975 - 1977, and Theological Studies: 1977 - 1981, at Bigard Memorial Seminary Enugu and Ikot Ekpene respectively. Priestly Ordination: Saturday July 11, 1981 by Most Rev. (now Cardinal) Francis Arinze, then Archbishop of Onitsha. Pastoral Experience: Assistant Priest of Holy Trinity Cathedral, Onitsha (1981 - 1982), Parish Priest of Umuoji (1983 - 1986). Further Studies: Moral Theology at Alfonsiana, Rome (1986 - 1991). He holds a doctorate degree in Moral Theology. He also holds Diploma in Italian Language, Diploma in French Language, Diploma in German Language and Diploma in Journalism. Teaching Apostolate: From 1991 till his appointment as the Co-adjutor Archbishop on 9th November 2001, he taught Moral Theology and Ethics at Bigard Memorial Seminary, Enugu. Rector: He was the Rector of Bigard Memorial Seminary, Enugu from 1996 to 2002. 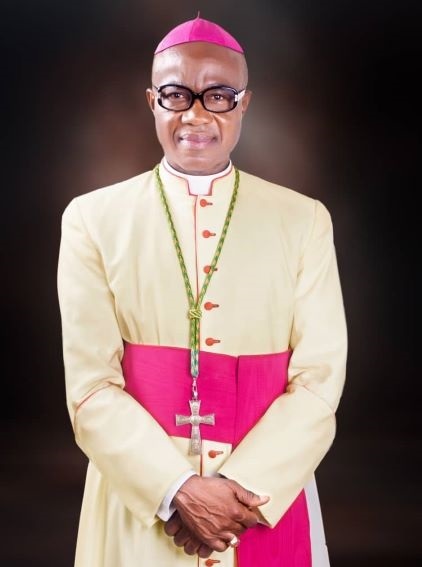 Episcopacy: Appointed Co-adjutor Archbishop of Onitsha on Friday 9th November 2001. And Consecrated Co-adjutor Archbishop of Onitsha on Saturday 9 February 2002 by then Apostolic Nuncio to Nigeria, Archbishop Osbaldo Padilla. He took over the Metropolitan See of Onitsha on Monday 1st September 2003. He is at the moment, the Committee Chairman of Catholic Bishop's Conference of Nigeria on Seminaries. He has earlier served as the Chairman of Synods and Pilgrimages; Episcopal Chairman of Family and Human Life and Episcopal Chairman of Pastoral Affairs and Liturgy of Catholic Bishop Conference of Nigeria. 1. The Nature and Identity of the Church: Nigerian Theological Perspectives (Ed.) 2002.